Some of you may be familiar with the problem … no sleep button on your keyboard. You have a really nice Mac, but you’re using a Windows keyboard since there is no MacOS keyboard that you really like. I’m using a keyboard from Havit (you can find it here). One of the things I hate about this setup is that I have no key or key-shortcut to put my computer to sleep. When you look at the Apple reference, you’ll only find keys that cannot be found on your Windows keyboard, like the Eject key, or the Power key. 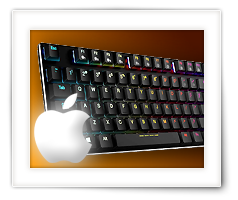 So in this article, I’ll show you, without the use of special software, how I have created a keyboard shortcut to put my Mac Pro to sleep, using a Windows keyboard. With every keyboard that comes with a Mac, has the option to put your Mac to sleep with a simple keyboard shortcut. Commonly, you will not find these keys on a Windows keyboard – which is where our problem started. p.s. I use this Havit Mechanical Keyboard (HV-KB395L) and can highly recommend it if you’re looking for a great and affordable mechanical keyboard. It’s nice and has a very low profile, has great tactical feedback and .. you can set the backlight of the keys to whatever you like. No special software or drivers on your Mac needed. I even stopped using my much more expensive Mac version of “Das Keyboard” (which is a great keyboard as well, just a little to high for my taste). There are powerful tools out there that can assist in remapping keys and help you do this when using a Windows keyboard with your Mac. Karabiner (also known as KeyRemap4MacBook) is such a powerful tool, recommended for more advanced purposes, and it is for free. However, I do not like installing yet another tool, especially for a simple task like this one. One of the cool thing with MacOS is that you can define your own keyboard shortcuts, per application or system wide. This is what I have used to create my “sleep” shortcut. One of the things you have to determine is: what key combination do I want to use to put my Mac to sleep? You’ll have to make sure it’s not used for anything else (system or application wise) – to avoid conflicts and unintended side effects. This combination has not caused any conflicts so far (knock on wood) and the F12 key is a rare key for MacOS to begin with. 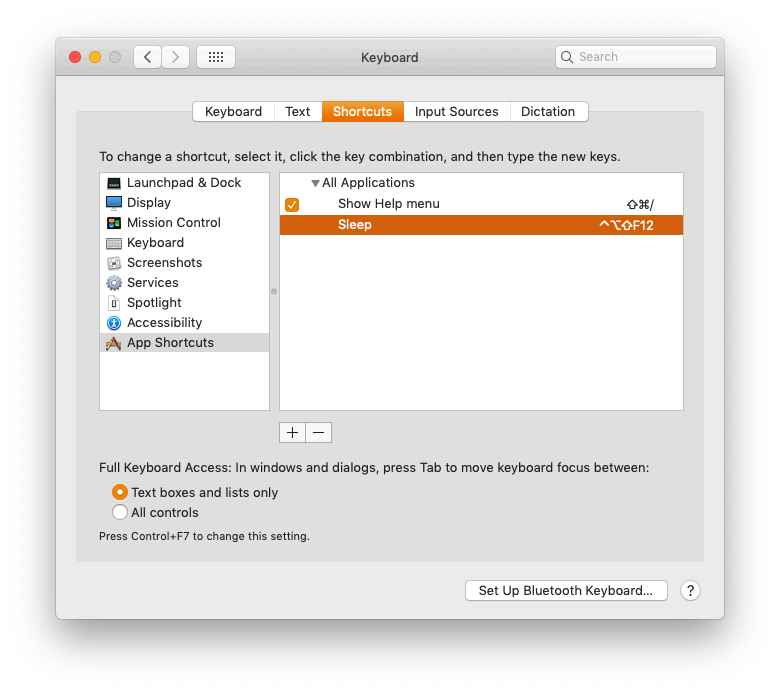 Before we start defining the keyboard shortcut, we will need to determine what the sleep function is called in the Apple Menu ( ) of your Mac. For each available language this may be called something else. Below an example of a Mac running in English. In the English language (which is what I use), my Mac lists it as “Sleep” (mind the uppercase “S”). With a Mac running with the Dutch language, this is called “Sluimeren” (who ever came up with these weird translations?). A Mac running the German language, would call it “Ruhezustand“. 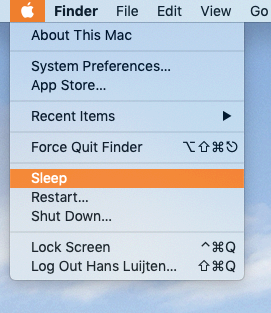 Write down what the “Sleep” option is called on you Mac! From here on, I assume you’re working in English and the word in the menu is called “Sleep” – don’t forget to use the word seen on your Mac. 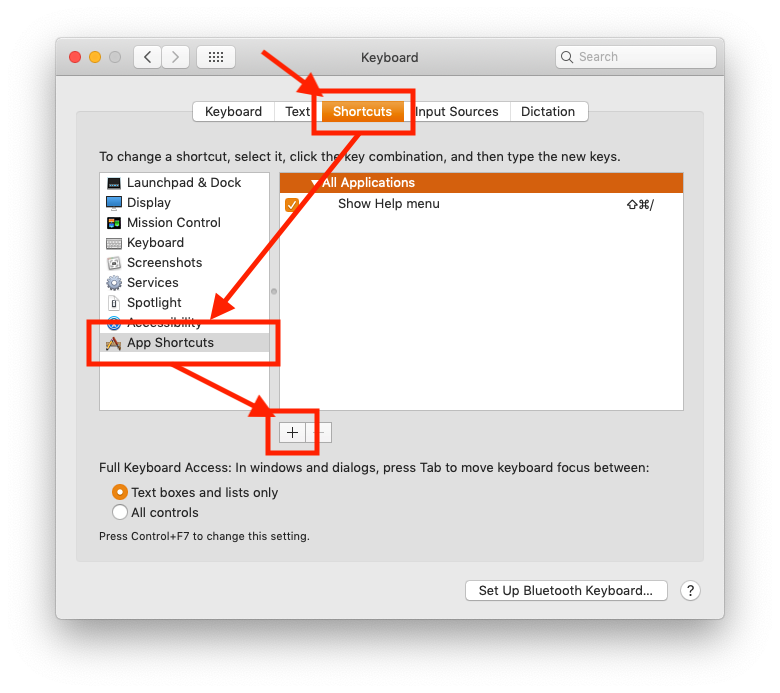 Your Mac already has a shortcut defined for your keyboard, and you may not need this tutorial, unless you have a second keyboard attached (for example with a laptop) that does not accommodate this shortcut. 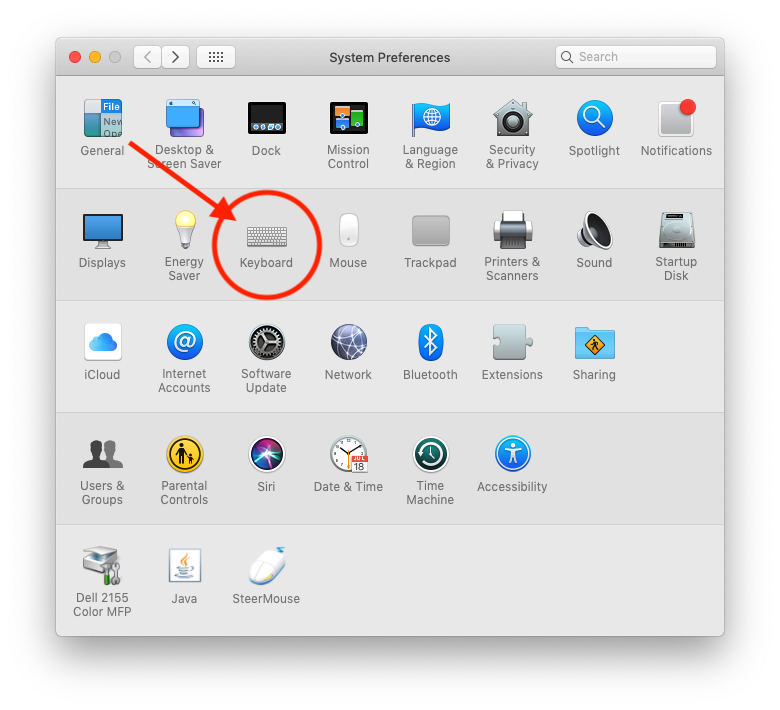 To create a keyboard shortcut, we will have to open System Preferences where we open the Keyboard options: Apple Menu ( ) System Preferences… . A window like this one, will open. In the window show above, select the “Keyboard” option, which will provide access to the keyboard preferences. In the “Keyboard” window, select the “Shortcuts” tab, followed by clicking the “App Shortcuts” and finally clicking the “+” button. First we need to make sure the field “Application” is set to “All Applications” – after all, we’d want the sleep function to kick in, no matter what application we have open. The field “Menu Title” is the one that is trickier. It should be the name as it appears in any menu. So in my case I will use the word “Sleep” (English MacOS), which we found in the Apple Menu. You did write that one down if you’re using a different language – right? So in Dutch “Sluimeren” and in German it’s “Ruhezustand”. Double check the word if needed. Finally we have to enter the desired keyboard shortcut. Click the field next to the text “Keyboard Shortcut:“, and press the key combination you’d like to use. If you mistyped, simply press a new combination again. Again: I use Shift + Ctrl + Alt + F12 , which has served me very well in the past few months. You can now, optionally, close the System Preferences window, and test your new keyboard “Sleep” shortcut. You can wake up you Mac, from a sleep, by pressing any key or mouse button. I typically press Shift or the left mouse button. If your keyboard and/or mouse are not plugged straight into your Mac, but into an external USB hub instead, then make sure the hub powered ON and your keyboard and/or mouse are ACTIVE. My keyboard actually is “active” when the backlight is ON, but you can also see it by pressing Caps Lock, or Num Lock key, and see if the indicator on your keyboard lights up or not. If your monitor has a build-in USB hub, and you use it for your keyboard and/or mouse, the same rules apply as for a powered USB hub. Make sure you monitor is ON and your keyboard and/or mouse are ACTIVE.